The plan of going grocery shopping fell through. My refrigerator looked pretty sad, but I still wanted something satisfying for dinner. That's when I came up with A Grown Up's "Tuna" Melt. 2) Combine skinless and boneless canned salmon, mayo, horseradish and chopped white onion. 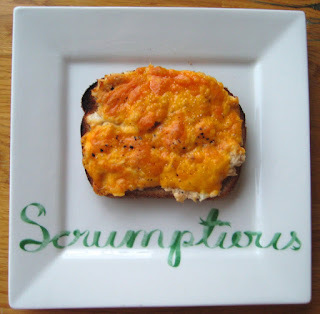 3) Top wholegrain bread with the salmon mixture, sliced cheddar cheese and freshly ground black pepper. 4) Let the cheese melt under the broiler for about 4-5 minutes. Serve immediately. mmmmmm that does look scrumptious! I love tuna! But would you believe that Ive never had a tuna melt in my life?! I gotta try this! i second what lina said! love the idea of cooking in the broiler. i will definitely be trying this with larry! I saw that plate at Fish Eddy te other day and was wondering what it'd look like with "real" people food on it...not disappointed! The melt sounds delicious!